ANNUAL OPEN ONLINE HORSE SHOW: to see all about this program please click on the link from the drop down menu of "Programs" to check out the 2018 rules & classes being offered! This program is for ISHR members and equines only. Must remain a current/active member for an entire year to receive awards and recognition at the end of the year. Members must keep log sheet record (per equine)for time spent in leisure riding and/or driving. (such as trial rides, group outings, parades, training, etc...) A separate log sheet is required for each ISHR equine being used in this program. The log sheets can be turned in monthly or at the end of the year. (no later than Dec. 1st of any given year) ISHR does supply the Ride/Drive Log Sheet. A Processing Fee of $2.00 is required each time a log sheet is turned in to the ISHR office. This program is for ISHR members and any equine they own that is not registered with ISHR. Must remaiin a current/active member for an entire program year to receive awards and recognition at the end of the year. Difference in this Open Ride N Drive Program is that a member must pay a one time fee of $5.00 per equine that is not registered with ISHR and that you are using in the Ride N Drive Program. Also, a picture of the equine is needed. The equine will be given a permanate "ENROLLMENT CERTIFICATE" with an assigned number. 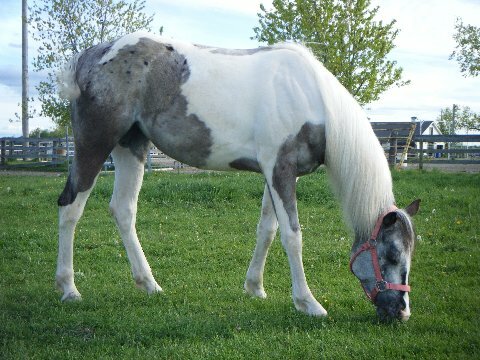 A file will be started for this equine and picture and enrollment application will be put in. A Processing Fee of $2.00 is required each time a log sheet is turned in to the ISHR office. Rider must keep a log of the hours riden and/or driven and turned in at end of the year. All other rules for applied with the regular Ride N Drive also apply to this OPEN Ride N Drive Program - as with the awards. ISHR will recognize and honor ALL show points, from ANYWHERE, that ISHR equines participate in. The horse owner must be a member in good standing and the horse must be registered with ISHR. Only points earned after the horse is registered will count -- none before. A signed "Show Point Form" from a Show Official showing the events/class's and placings earned must be turned into the ISHR office no later than 60 days from the show date. (ISHR supplies show point forms which can be copied) A one time yearly fee of $25 is required with the first show sheet OR you may pay a $3.00 processing fee per show point form (YOUR DISCRETION). RECOGNITION CERTIFICATES shall be awarded to members who earns 20 points by years end. ACHIEVEMENT CERTIFICATES shall be awarded to members that earn 60 or more points by years end. ROM - YEAR END HIGH POINT TROPHY award will be given to the ISHR horse earning the most points from at least (5) five different shows in the current year. Member MUST remain a current, active member for the entire year to qualify and receive award. When a member wins the YEAREND HIGH POINT three (3) years in a row - a special ISHR HOUSE TROPHY will be awarded. This is a "keeper" trophy. ALL SHOW POINT FORMS MUST BE TURNED IN TO ISHR OFFICE NO LATER THAN DEC. 15TH. 4) SUPREME CHAMPION certificate for 4 different "SUPERIORS". You can earn more than 1 Supreme Champion. This program was designed by ISHR to give people whose equines are registered with another "spotted" registry/association extra recognition by registering their equine with ISHR. To join this program, a person must send in a membership application along with the ISHR registration application ALONG with a copy of the "other" spotted registration certificate. The membership and registration applications must be sent in at same time. A person can register as many qualified equines as they desire throughout their free membership year (as long as a copy of the other certificate accompanies each application form for registration). 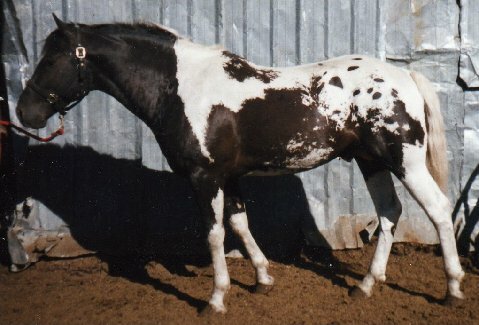 This program was established to give owners of (10) or more "spotted" equines a substantial registration discount. All equines must be registered at the same time to recieve the discount in registration fees. Below is a breakdown of how much a spotted horse owner can save in registration fees! 10 to 19 horses registered as a group at one time = $15.00 ea. 20 or more registered as a group at one time = $12.00 ea. 4 to 9 horses registered as a group at one time = $17.00 ea. PLUS you will recieve a LIFETIME MEMBERSHIP with the large Herd Discount! A year free membership with the "Small Herd Discount". The savings in registration fees are all quite substantial! It saves to register horse herds with ISHR! Left: Pintaloosa Foundation Stallion "Willie Of Wild Horse Prairie"
Right: Pintaloosa Foundation mare "Wild Rose April Breeze"